Down Syndrome | What is it? – Down Syndrome Group Of Erie County — Erie PA.
Home/Down Syndrome | What is it? In every cell in the human body there is a nucleus, where genetic material is stored in genes. Genes carry the codes responsible for all of our inherited traits and are grouped along rod-like structures called chromosomes. Typically, the nucleus of each cell contains 23 pairs of chromosomes, half of which are inherited from each parent. Down syndrome occurs when an individual has a full or partial extra copy of chromosome 21. This additional genetic material alters the course of development and causes the characteristics associated with Down syndrome. 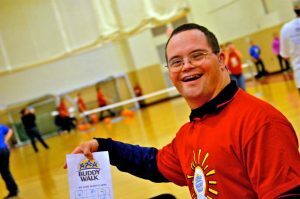 A few of the common physical traits of Down syndrome are low muscle tone, small stature, an upward slant to the eyes, and a single deep crease across the center of the palm – although each person with Down syndrome is a unique individual and may possess these characteristics to different degrees, or not at all.